You may launch Spread Matrix windows from Market Explorer and the Market window. 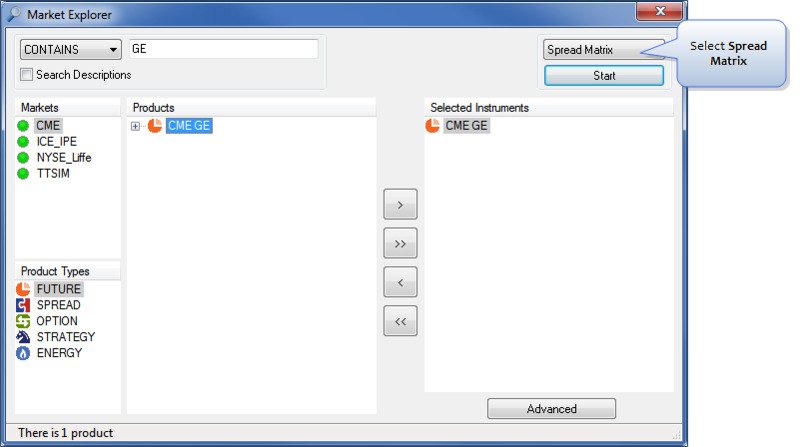 Select the instrument that you would like to display in the Spread Matrix. Click the button to move the instrument to the Selected Instruments field. Click the window drop-down list and select Spread Matrix. This displays the Spread Matrix populated with the selected instrument. Tip: If you select multiple products when you launch a Spread Matrix, the Spread Matrix generates a tab for each product. Note: You must select more than one month of the same product in the Market Grid pane. To select multiple contracts, press and hold the Ctrl key and continue clicking contracts. Right-click an instrument in the Grid pane that you would like to display in the Spread Matrix. Select Spread Matrix from the right-click context menu. This displays the Spread Matrix populated with the instruments selected in the Grid pane. You may also launch a blank Spread Matrix from the X_TRADER Control Panel. Click the (Spread Matrix) icon. Click the instrument that you would like to display in the Spread matrix from either Market Explorer or the Market Window. Drag the instrument into the Spread Matrix. This populates the Spread Matrix with the selected instrument.